With 2017 coming to a close, we're beginning to look ahead to the wearable tech we're expecting to see in the coming year. From new smartwatches, VR headsets and the tech that got delayed over the last twelve months, there's plenty to look forward to. These are the biggest innovations we know that are coming, plus the ones that are heavily rumoured to join them. Whether you're an Apple, Fitbit or Samsung fan, we think there's going to be a lot to be excited about. Let us know in the comments what you're waiting for and why. Alongside the big Ionic reveal, Fitbit revealed it was going to launch a special Adidas edition of the smartwatch and it's slated to launch in 2018. Sounding a lot like Apple and Nike's hook-up on the Series 3, the Adidas edition of the Ionic will feature a sporty perforated strap, some new watch faces and Adidas branded workouts. While the sports apparel giant recently decided to cut its digital fitness division, we're still hoping that it has something special in store for this Fitbit tie-up. There's no news on whether it'll be priced the same as the standard Ionic or precisely when it'll launch in 2018, but we'd like to think we won't be waiting too long for the Ionic Adidas edition to turn up. After kickstarting the high end VR revolution, Oculus looked like losing its headset crown to HTC's Vive. After some big improvements with its current setup in 2017, we also have its first standalone headset to look forward to in 2018. 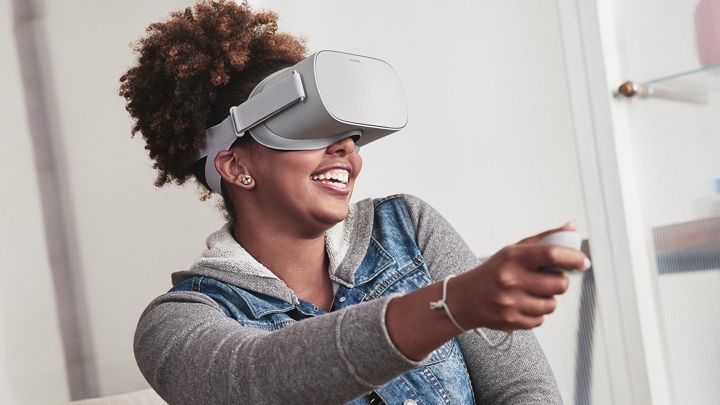 The totally wireless Go aims to offer an experience sitting between mobile VR and the high-end Oculus Rift. It will work with six-degree-of-freedom controllers and has inside-out tracking, so you won't need any external sensors as well. The Go is set to cost $199 and we expect it to land in early 2018. We know Apple pretty much works like clockwork when it comes to annual updates. So with the Series 3 unveiling made in September, you can bet we'll see an upgraded Apple Watch Series 4 around the same time in 2018. The rumour mill has already started with speculation it'll be packing a slimmer design, smart straps, sleep tracking and see a ramp up in the performance department. The headline feature, though, is tipped to be serious health tracking, something that Apple has been dipping its toes into over the last couple of years. But this could be the moment that its smartwatch does more in the way of helping to combat conditions with the addition of an electrocardiogram heart rate monitor to help detect serious heart conditions. We initially thought the Samsung Gear Sport was the natural successor to the Gear S3, but apparently that was not the case. That could then mean that in 2018 we'll see the next cutting-edge smartwatch from Samsung that will no doubt be packed to the rafters with features like its predecessor. Top of the list of rumoured features include a new design, support for Samsung's Bixby smart assistant and a bigger push into health tracking just like its big rival above. Based on when the Gear S3 and the Sport were unveiled and launched, we might have to wait until the fall before finding out the concrete S4 details. Finally, Magic Leap is ready to let the world get their hands on some of its hardware in the shape of its Leap One augmented reality glasses. Looking like a pair of futuristic swimming goggles, the Leap One Creator Edition will be packed with cameras, microphones and will be accompanied by a 6DOF (degrees of freedom) controller with haptic feedback to ramp up that immersive feeling. Right now, we know that it will be launching 2018, we just don't know when. The Creator Portal to let developers create experiences for Magic Leap opens up in early 2018. So hopefully the hardware will follow up soon after that. Apparently the AirPods have been flying off the shelves and with the wireless earbuds having not been given an upgrade in 2017, 2018 looks set to be time for the second generation AirPods. Seasoned KGI Securities analyst Ming-Chi Kuo believes that will be the case leaving us to speculate how these buds could get better and smarter. Will we get fitness tracking, improved Siri support and better battery life? There's every possibility all of those will happen. Let's just hope there's enough to go around for everyone that wants to go truly wireless this time. In 2017, it was reported that Fitbit engineers are already working on a successor to the Charge 2, which could mean that we'll see the new fitness tracker land in the next twelve months. What can we expect? Well it sounds like sleeker design is a dead cert, while we could see some of the features included on its Ionic smartwatch filter down to the Charge 3. Top of our list would be waterproofing with swim tracking, built-in GPS and maybe it'll dip its toes into the health tracking that Fitbit's smartwatch will one day deliver too. Along with the Charge 3, we're also expecting to see a new Blaze, Fitbit's kind-of-but-not-really smartwatch. It sounds like we can expect a skinnier look here as well and with its smartwatch look, it makes a lot of sense to give it access to that new Fitbit Gallery app store. That would mean bringing apps to the Blaze for the first time. Features like built-in GPS seem unlikely, but better integration for Fitbit's new Coach platform seems like a no brainer. Whatever Fitbit has in store, we look forward to seeing what it officially unveils. The hydration monitoring wearable developed by BSX raised over $1 million in 2016 making it one of the most successful wearable tech projects in crowdfunding history. It was scheduled to launch in 2017, but that did not happen. The team behind it revealed it was having trouble getting the innovative tech to fit into the slim form factor it promised to deliver. Unsurprisingly, backers are not to happy, but with a big round of investment, which included Samsung among the companies to put its cash behind LVL, we hope it will finally turn up in the summer just in time to put it to the test during those hot running sessions.